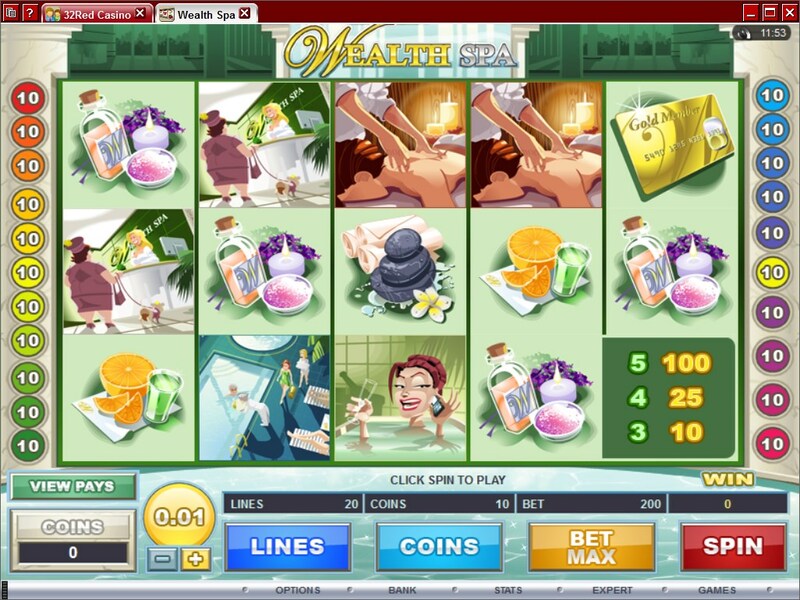 If you love being pampered, Wealth Spa is one of the few games that are themed around a spa for rich women. Designed by Microgaming, it has a theme that I for one haven’t seen in other slot machines before, and it seems to be very well handled, both from a design point of view and when it comes to the features. You will especially enjoy the bonus features and the way they are triggered, but you will have to read the review to learn more about them. The relaxing design incorporates a total of 5 reels and on them there are 20 paylines. Wilds and scatters are both present, but the really cool part is related to the bonus games, five of them being present and triggering both prizes and free spins. The one thing I’m not a fan of would be the $5,000 jackpot. The wild symbol is present and it can be of great help, but the bonus game system takes center stage, being a lot of fun and capable of triggering up to five different bonus features. Among them there will be one that gives you free spins. There are wilds and scatters in the game, but they’re not going to be the ones that give you access to the five bonus games. Instead, they are used as very simple features. One example would be the scatter symbol, which will offer prizes and that’s about it. Whenever you get three to five scattered Gold Credit Cards at the same time, you’re going to get paid, with an amount which is the equivalent of 2 to 50 times the wager. As for the wild symbol, the image chosen for it is that of the Wealth Spa Logo. In this case, you do need the symbols to be on active lines, not just spread around. If you manage to land between three and five Logos on the same line, while also going from left to right, you’re going to get payouts of 100x to 5,000x, the best that the slot has to offer. The really cool part in this game would be the bonus features, which are all obtained the same way, with the help of collectable Tokens. The Gold Coin Token has to appear in the middle position on the 5th reel in order to matter. Each bonus game needs a different number of tokens to activate, so you can get a feature started as soon as you get your first token, or you can collect up to five before you do this. This is the first bonus game, the one that you can activate with a single token. You are taken to a screen where a blender is present next to various types of fruit. You choose four of them to be ingredients in a smoothie. Once the blend is made, you find out how much you’ve won. Another feature that can be started in Wealth Spa, it needs two tokens to start up. This feature shows you someone that is having a hot stone massage. There are five stones total, and you have to pick two of them. Next, they are positioned in random locations and then they show you a mystery multiplier that is applied to the round wager. With three tokens needed to start it up, Body Wax is an especially fun feature. Someone is having a body wax done, and they scream in pain in the process. The Scream-O-Meter measures how loud the screams are. A total of three screams are measured, and the loudest one determines what prize you take home. The fourth bonus feature needs four tokens. You see a blonde guy in a bath tub, and you choose the bath oils that will be added to the water. You get cash prizes from most of the bath oil bottles, but one of them gives you the Collect message instead and ends the round. This is the last bonus game and the one that needs the maximum number of tokens, which is five. You get up to 25 free spins from this feature. You have to pick various hot spots in order to increase the number of free games. The free spins don’t use the base game paytable, instead relying on another one, with the same symbols but with much smaller values. You can expect to cover as many as 20 lines in this slot, but you’re the one that decides how many are part of the wager. For the line bet, you are asked to choose the number of coins, which is between 1 and 20. You also pick the denomination of the coins which will be used that round, the range being a very limited $0.01 to $0.05. The maximum line bet is $1, while the total is $20. The $5,000 jackpot is not as big as I would’ve liked it, but since the line bet only goes up to $1 it’s a decision that’s understandable. You will definitely see why a spa is so relaxing when you notice the design of Wealth Spa. There are lots of symbols with hot stones, refreshing natural drinks or massage oils on them, there are very happy clients, gold credit cards and various areas from the spa. A lot of very light green is used, especially in the background of the symbols and all around the reels. Symbols: Wealth Spa Logo (wild, 5,000x), Gold Token (bonus), Gold Card (scatter, 50x wager), Bath (2,000x), Massage (1,500x), Sauna (1,000x), Pool (800x), Reception (600x), Robe & Slippers (150x), Essential Oils (100x), Hot Stones (80x), Dinner (60x) and Breakfast (50x). The game is very relaxing indeed, and not just because of the many bonus games which will provide the entertainment. Its design fits the spa theme perfectly, it doesn’t cost you an arm and a leg to play, but it doesn’t make you rich either. This Wealth Spa slot is offered by all online casinos with Microgaming software, playable either in practice or in real money mode.